The Hyde Creek Watershed Society operates an Education Centre and Salmon Hatchery. It is run by a group of dedicated volunteers working to preserve and enhance fish and wildlife habitats and promote environmental awareness & education to the Public. Their salmon rearing pond was being ravaged by predators and was in need of some protective help. We offered to help the situation by donating our resources and expertise by putting up predator netting around the pond. Now, they salmon have nothing to fear and can be raised to maturity in peace and safety. 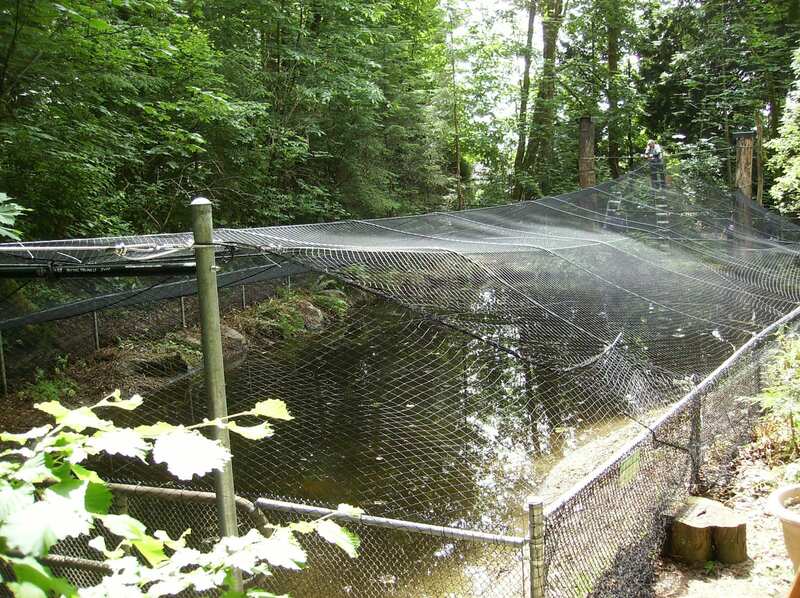 Finished predator netting around salmon rearing pond. On behalf of the Hyde Creek Watershed Society, we would like to thank you for your kind donation. This generous donation assists us greatly with our on-going project of securing our salmon rearing pond with predator netting. The netting is now in place (Photos attached.) An acrylic fish with your company’s name has been placed on our hatchery wall.